As Jerry once told George, "The fabric of society is very complex." Yes it is, Jerry. Yes it is. Here's to lines from the Seinfeld show that make life less complicated. An outlandish observation to use on those who are beside themselves when they lose something precious to them, and they need someone to help them get a hold of themselves. Elaine and Jerry accompanied George to a dinner party where they got stuck and she got bored. Crowd-watching from a settee, Elaine beheld a woman carrying on mawkishly about her fiancée, Where is my fiancée? “I have lost my fiancée,” she exclaimed to Elaine, “the poor baby!” As if reading a placard, Elaine delivered this “baby”-on-bored reply. Think “the dog ate my homework.” But where “dog” is a story made up to cover up one’s own laziness, “dingo”—a type of Australian dog—is a true story, brought up here to point out another’s craziness over their “baby,” whatever it is that, when they lose it, makes them lose it (“Maybe the dingo ate your strongbox key”). Elaine’s line stems from the real-life account of an infant death in Australia at the hands—er, jaws—of…well, you get the picture. 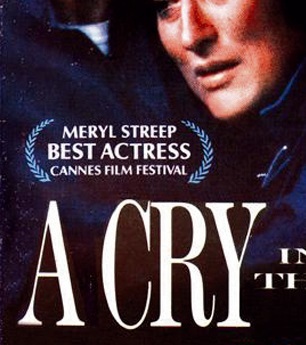 The Meryl Streep motion picture A Cry in the Dark immortalized the story. As with quoting a movie (even a famous one), the risk of dumb looks or backlash is high with this line, but a high five is also not altogether out of the picture. You might kill it, as they say in comedic circles about a bit well done. Or you might be killed—the bit flops. Either way, “dingo” is worth it*, to let them know you’re killing me.